This photo was shot from a cul-de-sac in a 1960s subdivision in Medfield. Think that street is wide enough? For all you streetscape wonks, it measures 38 feet from curb-to-curb, with five foot sidewalks. In comparison, the standard low-density residential street in Seattle is 25 feet curb-to-curb (these are the streets on which it is impossible for two cars to pass each other when cars are parked on both sides of the street). 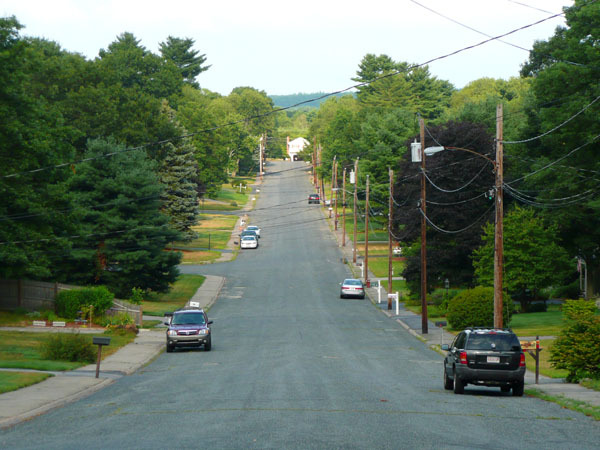 On this street in Medfield, only in some highly unusual circumstance would there be more cars parked on the street that what you see in the photo above, and in any case, most of the houses have driveways and garages that could hold four or five cars easily. And there is so little traffic that the meeting of two cars traveling in opposite directions is a very rare occurrence. All that unneeded pavement is a perfect match for all the giant lawns. This is the built environment of a dying era. Posted by dan bertolet on	Wednesday, July 23rd, 2008 at 7:11 am. You can follow any responses to this entry through the RSS 2.0 feed. You can leave a response, or trackback from your own site. Is the era over yet? Just in case the Soviets launch those missiles! It was a great idea they had to leave room for bike lanes, sidewalks, and a light rail line. Once they convert all of those lawns to 8-story condos with retail on the ground level, this might be a nice place to live. Bob: We get this argument, actually. I work for a mid-sized Bay Area city (100,000 people) with few tall buildings. Our big boy fire truck, the GRUMMAN (said with a reverant tone) means big streets. I’m a fairly recent transplant to Seattle from the SF Bay Area, and at first the wait-to-pass streets shocked me. But now that I’ve lived here for a while I love them. Nobody drives more than 15mph on a residential street under these conditions (especially with turning circles every other block), which makes the neighborhood feel much safer and quiet. Of course getting a moving truck in there is difficult, but possible. I would imagine navigating a fire truck would be tough but possible as well. >>> Team America >> What’s Even Huger Than Hugeass? >>> lighting >> It’s Almost Painful To Witness The Seattle Times Editorial Board Continue To Flounder Towards Total Irrelevance. Almost. hugeasscity is powered by Wordpress. Mezzanine theme by Redworks.